Women with more muscle are more likely to survive breast cancer, a study finds. It may be the last thing that anyone struggling with breast cancer is thinking about, but it's important: Get some muscles. A new study published in JAMA Oncology finds that women with breast cancer who have more muscle mass have a better chance of survival. In general, when people aren’t well they can lose a lot of weight, and much of that weight is muscle. Low muscle mass, called sarcopenia in medicine, also often occurs as we age, and it seems to correlate with poorer outcomes in people who are chronically ill, including those who suffer from cancer. Previous studies on breast cancer and muscle mass have been done on women with more advanced cancer. This new study included younger women with less advanced breast cancer, and it found that even among this group, a smaller amount of muscle is associated with a poorer outcome. The study included 3,241 women from Kaiser Permanente of Northern California and Dana Farber Cancer Institute who were diagnosed between January 2000 and December 2013 with stages II or III breast cancer. Higher muscle mass means better survival rates, regardless of a woman’s age or cancer stage, the researchers found. Lower muscle mass, on the other hand, is associated with a higher risk of death. The researchers, who used CT scans of participants to look directly at how cancer affects muscle, aren't sure why low muscle mass is linked to lower survival. But they suggest it may have something to do with how cancer directly affects muscle tissue. Cancer-related inflammation may cause muscle mass to go down, and fat deposits to go up. (STOCK PHOTO/Getty Images) A woman practices yoga in this undated stock photo. The takeaway for women whether they have breast cancer or not is to build more muscle. “If we’re all going to deal with [muscle loss] as we age, better start identifying it as a risk factor now, and targeting it, so we can minimize its impact,” said Dr. Jennifer Ashton, chief medical correspondent for ABC News. Women can build muscle in multiple ways. Lifting weights at the gym, even light weights can make a difference. Also effective are exercises that use your own body weight to build muscle, like squats, push-ups, lunges, and planks. A lot of women like yoga, Pilates, or step classes for these very exercises. Dr. Ashton recommends using an exercise vest with 2 or 3 pounds loaded in while you’re running your errands. Building muscle will help to keep you as physically strong as you are mentally strong. 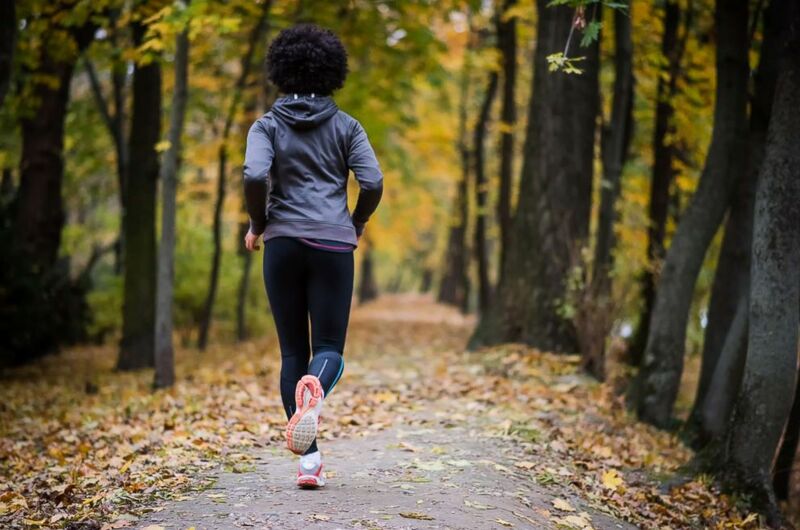 (STOCK PHOTO/Getty Images) A woman runs along the path in this undated stock photo. Keep in mind, a good diet -- particularly one with protein -- helps build healthy muscle. Good sources of protein include lean meat, eggs, yogurt, fish, beans, and nuts. The recommended daily allowance (RDA) of protein is based on your weight. A women who weighs 125 pounds needs about 45 grams of protein in a day. That would be about 3 ounces of chicken and 3 cups of milk in a day. Eat the protein another way and it’s 4.5 ounces of salmon and 100 almonds. No matter what foods you choose, don’t forget the protein. Laura Shopp, MD, is a pediatrics resident affiliated with Indiana University working in the ABC News Medical Unit.